It’s no secret we’re devotees of the Sportster, this oft maligned platform is cheap, plentiful and well supported by the aftermarket. Created in the late 50’s as a muscle bike, favored by Elvis and later ruling the dirt track oval with an iron fist, the XL has a storied past. The grim days of the elephantine wheel production chopper saw it relegated to “girl bike” status and to add insult to injury the Sportster was at the heart of the factories Dark Custom embarrassment. The adage, what does not kill you only makes you stronger, must also be true for motorcycles as the XL has not only survived, but has become the go-to platform for hardtail choppers, high bar bobbers, cafés and if the folks at Burly have their way, as a dirt worthy Scrambler. One would be hard pressed to name another bike that is as versatile, easy to work on and inexpensive to own as the beloved Sportster. This particular unit is a 2006 883, the tamest of the Sporty models and in its previous life shuttled a retired teacher to and from his daily tennis game. Its destiny would soon change as David stripped it to motor and frame with an eye towards transforming the bike into an authentic Scrambler. 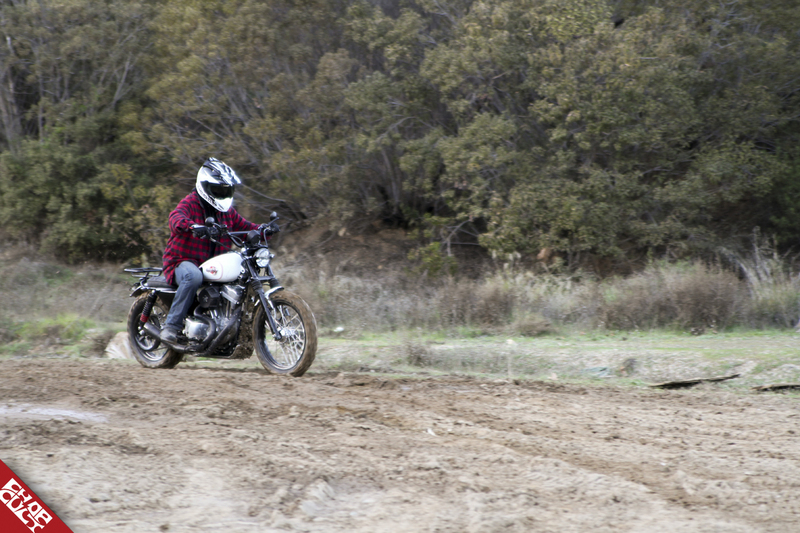 We had to ask, Umm what exactly is a Scrambler? Zemla explained it this way, “A Scrambler is a unique hybrid of asphalt and dirt initiated in the 60’s and 70’s to address a market that was hacking up their street bikes to tolerate fire road bombing. The more popular iterations came with a Honda or BSA badge and in recent years this style has been resurrected by the folks at Triumph.” Yeh, we knew that. What does it take to transform a milquetoast cruiser into real deal dirt scooter? Giant knobbies are a good start, but the Continental TKC80 tires only come in a 17” rear, so the original rims also got an update courtesy of Ride Wright. The stock size 19” front was retained and both ends are stopped by four piston Performance Machine calipers. Suspension is naturally Burly Brand and runs a higher rate spring in the fork and a set of their 15” Stiletto shocks in the back. 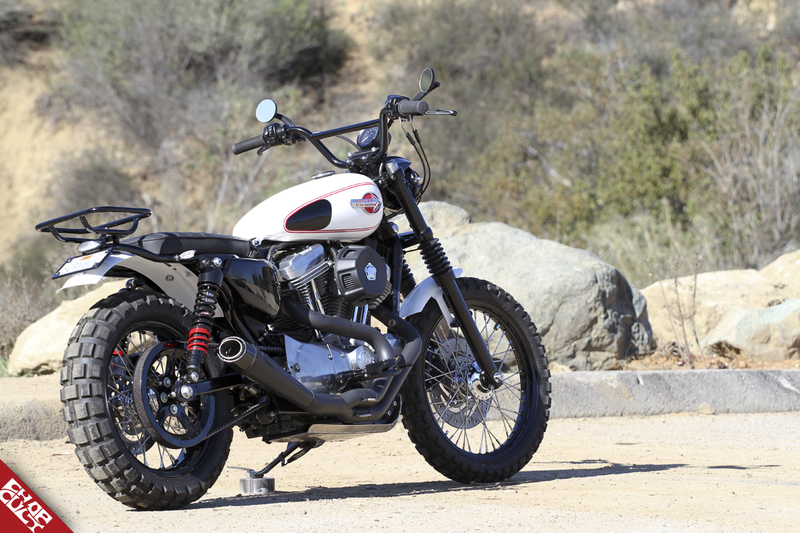 The end result is an un-Sportster like, but very level chassis. Speaking of chassis, this one also saw the business end of a Makita grinder and the fender struts were replaced by a pre-bent hoop from Dime City Cycles (queue scrambled egg sound of MIG welder). If you followed the build thread here on CC this was the point where it started to look like a proper Scrambler. A pair of Monster Craftsman ribbed fenders and an NOS Six-Pack rack were sourced via Ebay. The headlight grill was originally intended for a moped and turn signals are Kuryakyn. David hand built the seat pan to lay over the updated tail section and had it covered by a local upholstery shop. 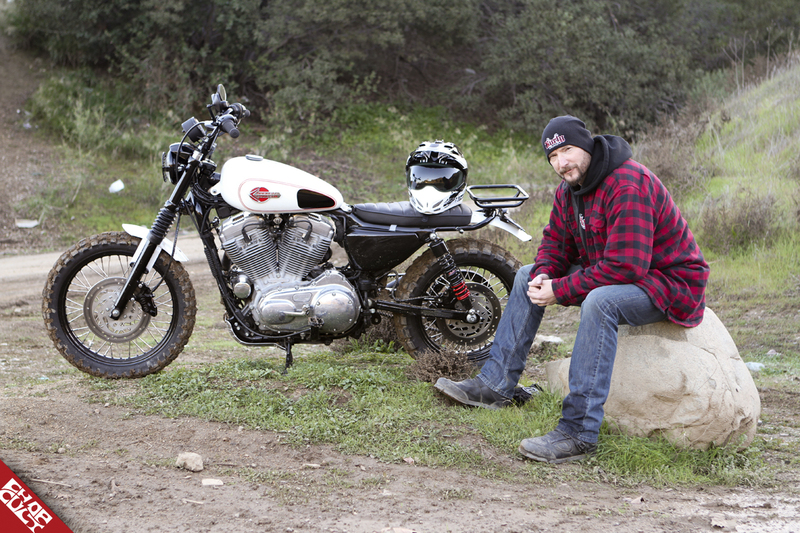 “I really wanted a flat seat and it took several tries to get it to look right on the Sportster”, explained Zemla. Final touches include Biltwell grips, a hand fab’d skid plate, Vance & Hines air filter and an RSD low pipe that was so new it was swiped off of a tradeshow display. The end result is very much what David and his crew had dreamt up. 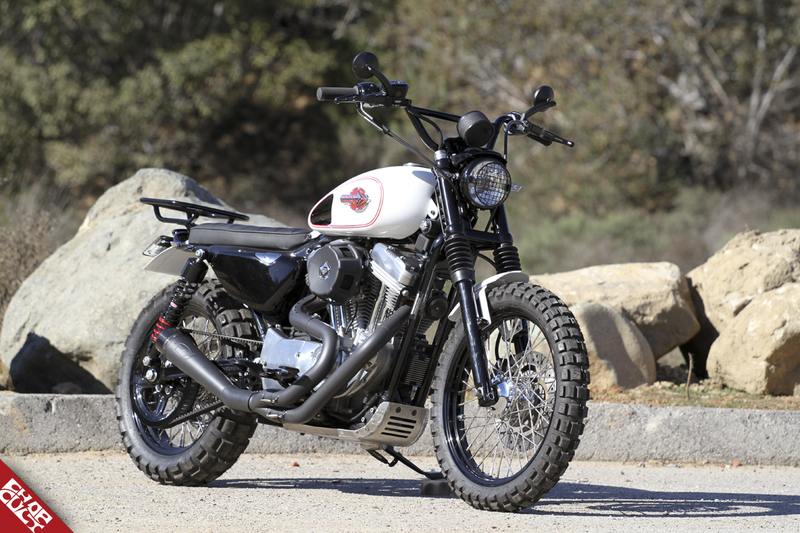 A Sportster alternative with a decidedly dirt slant to it and we got to see it all built here on Chop Cult. Fork: HD with a 2” Burly drop kit inside. Chassis mods: Cut fender struts off, fab’d rear hoop using Dime City pre-bent unit. Tire/wheel size and style: 19 front (stock size) and 17” rear to accommodate Continental TKC80 rubber. Rims by Ride Wright. Other mods, accessories, cool parts, etc: RSD low pipe, NOS ATC Six-pack rack. Burly Scrambler bars. Burly 15” Stiletto shocks. Biltwell grips. PM Brakes. Proto Burly Belt tensioner and skid plate. V&H air filter. Great build, def. thinking about a sportster for next winter build and I may just have to jock your style with that ATC rack on my Yamaha! Steal away, the rack has proven damn useful to have. Funny, I was just pondering about using an 883 for a tracker'ish build. Jump on here, and I find this. Very well executed build. It looks like a helluva lot of fun. My only complaint? No action shots. C'mon, lets see it sideways throwing dirt, or better yet, airborne. Dude! It's a Sporty! It does not fly well. We did a bunch of action shots, will add some to the build thread when we get a chance. In my part of the world many bagger folk seem to hold dirtbikes in disdain.. 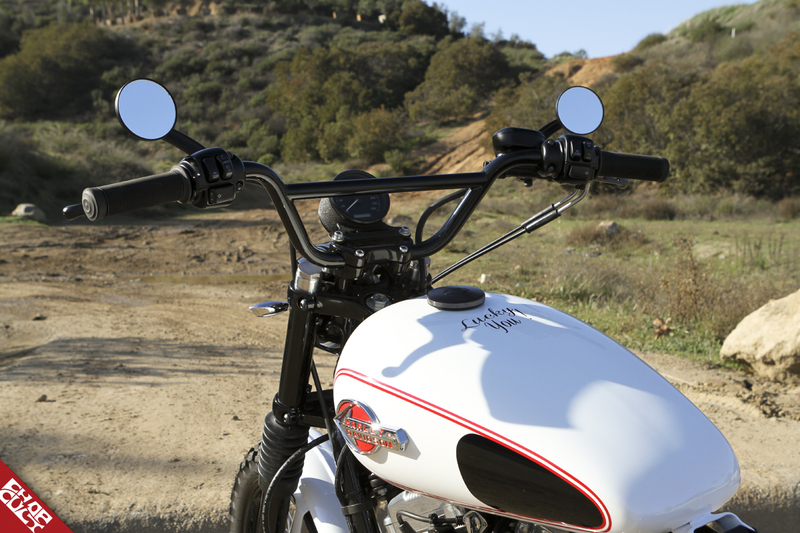 The Sportster is a great bike off the showroom floor, the garage floor or craig's list. Keep 'em coming. I love this look, I'd love to do something up like this for TOL only using a parallel twin. Nice work David, I love your other Sporty also the plaid one, that makes quite a pair. Pthe inspiration for my tracker Triumph project. Who told me recently that scrambler is the new black? He was right. My minds blown! Glad you guys dig the bike! Gonna go load up the rack with beer and celebrate! I ride a bagger, a softail, and a drz 400 for enduro and dual sport. I have always imagined bombing fire roads on a sporty, and have seen a few done this way. Yours is tops man, love the rims and tkc's, the bike just looks " RIGHT"
I love what you've done with this machine, a really well done styling exercise that also has some functional benefits. Thanks guys!! We're stoked that you guys are into this build!